2017 saw the dawning of our third year of action, while in the years before we had focussed on our local partner fundraising services through Face to face and other fundraising channels with The Orangutan Project and Rainforest Information Centre, this Year was all about our international partners and of course the grass roots movements in Australia. Considering that we worked with wonderful individuals that help save the rainforests of the world this was not too challenging. The annual Impact of our organisation helped adoptive 15 baby orang-utans, improve the protection of some of the few wondrous terrestrial ecosystems left on the planet. And put a stop to mining on a 25 year old protected area in Ecuador in the magnificent Cotocachi-Cayapas Ecological Reserve. We continue our work with our partner Rainforest Information centre to keep protecting Ecuadors rainforests. All data compiled by TRP. A year In the forest. At the end of 2016 and after two years of action, we at TRP realised that many organisations that worked on rainforest and environmental conservation battled with the usual things all start-ups and businesses had to deal with. Namely access to resources, skills and a committed audience. These problems were magnified by the fact that all work was completed with a non-profit ethos. The question remains how do we justify our engagement in saving these superb ecosystems with limited resources and in the face of industry that totally out spends, steam rolls and out markets our actions. The answer of course was obvious and I discovered this during visit with some friends who are attempting to keep VIC Forests and the government of Victoria from destroying greater glider and spiny lobster habitat. The wonderful people at W-tree in Victoria have banded together a peoples movement. They are group of committed environmentalists that traverse the dangers of the snowy ranges by foot overnight, to record and identify habitat of threatened species on the brink of extinction. The outcomes of such a small and purposeful movement have been awesome, The group recorded a population of Victorian spiny lobsters and succeeded halting VIC forests logging action. This outcome is testament to one aspect the big industrialists and miners around the world will never be able to gather, that is Heart! In 2018 we at TRP will be wearing our hearts on our sleeve, we are putting up the challenge to you, to join us protect, preserve and promote the rights of the rainforest. The Rainforest Project was created over a cup of coffee and chat on Bourke Street, Melbourne. Australia. It arose from the founders realising the importance of enhancing collaboration in the sector. The conservation sector continues to be fairly fragmented today and we work towards reducing this by improving networking and collaborative opportunities. Obviously many rainforest organisations would be benefitted with access to improved support that helps them raise funds, be compliant and strategise. We began by offering fundraising services to our partners where we raised over $500,000 for partners through regular gifting over the year. As far as we know we are the only charity that offers this service to other charities, insulating our partners from all the bad press linked to for profit supply chains for direct marketing. We continue to offer over 2000 hours of pro-bono support to our partner, Rainforest Information Centre, an organisation that has been instrumental in protecting the forests of Northern NSW and Tasmania. A similar number of hours of pro bono support is offered to our international partners Rainforest Rescue International- Sri Lanka that is working on the Singharaja Rainforest Corridor. 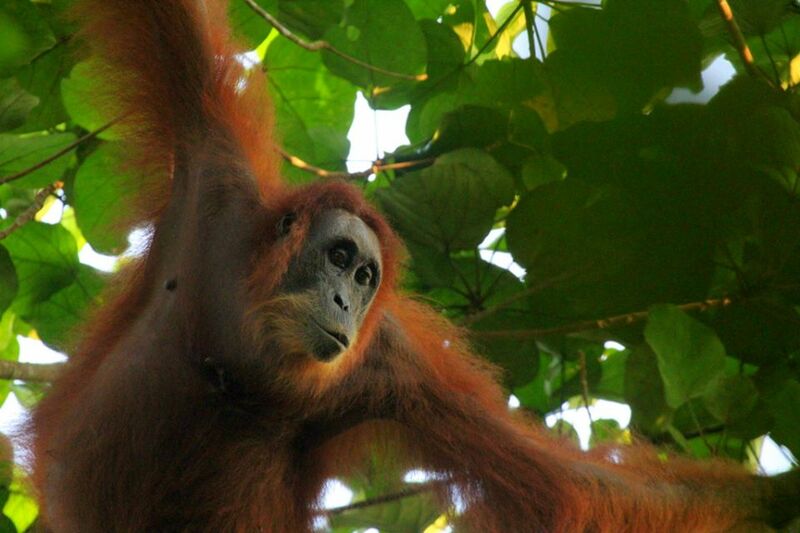 and the Orangutan Information centre in Sumatra. In early 2017 we placed a conservation scientist with Orangutan Information centre, to support them with capacity building in Forest patrolling and supplied over 5 camera traps for this group, through our crowd funding site - fundmyplanet which we co manage with the Rainforest Information centre. Funds raised for project partners through DM. The Gunung Leuser Ecosystem is considered an ecosystem of great global biological significance, the total ecosystem is only 1.6 Million Ha and was once connected to the greater Indonesian rainforest that spanned over 50 million Ha. Unfortunately in the past 50 years, deforestation for industrial agriculture has seen the destruction of this once great forest which has been reduced to many fragments. The Gunung Leuser ecosystem is now the only intact ecosystem in Indonesia that is large enough to provide habitat for flagship species Sumatra tiger, orangutan, elephant and rhinoceros. All these species are now under considerable threat from the continuing expansion of oil palm, including ever increasing illegal conflict palm oil. Additional pressures from illegal logging for valuable forest timbers and trade in wildlife continue to harm the constitution of the Gunung Leuser ecosystem. The Rainforest Project, Australia and in-country partner The Orangutan Information Centre based in North Sumatra are engaged in enhancing restoration activities and wildlife patrolling actions within the Gunung Leuser ecosystem for the past two years. The collaboration has carried out a number of gap analyses in order to enhance the conservation of the existing protected area within the Leuser ecosystem boundary and in partnership with government forces. In 2018 we will be working closely with our Indonesian conservation partner to develop a stronger response to illegal wild life trade and illegal and conflict palm oil that threatened this magnificent rainforest ecosystem. Save the Last of the Rainforests!